I was just walking through the hall with my friend Yvonne Hallman, and it occurred to me how much learning is going on here. You’re either in-session or in-world. 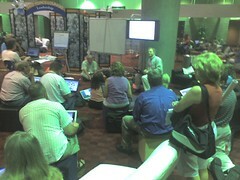 You are either having fantastic conversations in the hall, or engaged in one of the poster session or the new lounges. Right out side the room I’m in right now (B303 Avatars) is what looks like an impromptu session, where people are sitting on the floor, on sofas, standing and leaning. You can’t turn around here without learning.